30 Day Book Challenge: Day 3 - Your favorite series. I actually haven't read too many book series as an adult. Sure I love the Harry Potter series, but that seems kind of obvious and easy. Plus, I've had a sort of rocky relationship with Harry Potter, and it was only this past year, when I decided to reread the entire series, that I discovered how much I do actually enjoy these books. J.K. Rowling is a pretty masterful storyteller, and when I reread the first installment, I was reminded of just how much fun reading a good book can be. I've also read a fair amount of dystopian young adult series (The Hunger Games, The Maze Runner, Matched), but besides the Divergent series, I can't really say that I enjoyed any of these as a whole. By and large, I found that most of these series got less interesting and less engaging as they went on and ended in pretty unsatisfying ways. Divergent is definitely an exception, and while the series has its flaws, I think it's an engaging, fast-paced, and engrossing read that explores a number of in-depth and compelling issues. I also cannot wait for the film to be released in March - I think it has the potential to translate really well onscreen. Plus, Kate Winslet is playing the bad guy. She is going to be amazing! I think the book series I enjoyed most were the ones I read as a child. I won't go as far back as my Berenstein Bear days (though how good were those books?). I read so many great series during my childhood (Anne of Green Gables, Little House on the Prairie), but I think my favorite is the Dear America series. I still remember getting my first Dear America book. 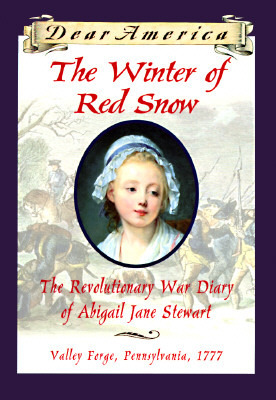 It was a birthday present from my aunt, uncle, and cousins (I think I was ten or eleven), and they gave me The Winter of Red Snow: The Revolutionary War Diary of Abigail Jane Stewart. For those of you who aren't familiar with the Dear America series, these books were written as diaries by young women who lived through specific important historical moments: the Revolutionary War, slavery, the Civil War, the Oregon Trail, the Titanic, World War II, and the May Flower. I consumed these books as a child. I learned so much about history through these books (especially since each contained a lengthy historical note at the end), and I loved that they centered around compelling and complicated young women, many of whom faced numerous struggles, difficulties, and oppression. The books dealt with various important issues, such as race, gender, religion, immigration, and education, but they all managed to capture how each of these young girls still managed to grow up, finding joy, laughing, and discovering their place in the world, despite the often uncertainty and fluidity of their situations. In addition, I really enjoyed the diary conceit, as it offered a very intimate perspective on what life was like during these important historical moments. I carefully saved my money so that I could buy every Dear America book that I could find, and in a few years, I had amassed some 15 or so titles. What amazes me, though, is that the original series contained more than 35 books (my ten-year-old brain is exploding!). The series was relaunched in 2010, and since then, it has added even more titles. In addition, the Dear America series is unique in that the books are written by different authors, and in doing so, it really succeeds in capturing a diverse array of voices and perspectives. More than anything, though, these books just made me excited about reading. Whenever I picked up a new installment, I couldn't wait to get lost in its pages. Each book managed to engage me in a different way, and reading was always fun. These books contained stories that I wanted to hear, and every time I sat down with one, I couldn't wait to find out what happened next. As a kid, that was what made reading so special and magical for me and why reading was and still is one of my favorite things to do. I had never really thought about it before, but it does seem like I read more standalone books and less series as I have gotten older (though that may depend on whether a trilogy counts as a series). P.s. Love the Bears shout out. Those were great books! I had completely forgotten about the Dear America books! I only remember reading two or three of them, but I did enjoy them! Great pick.